For other people named Robert Hall, see Robert Hall (disambiguation). Robert Edwin Hall NZBS MBE (14 January 1961 – 11 May 1996) was a New Zealand mountaineer. He was the head guide of a 1996 Mount Everest expedition in which he died, along with a fellow guide and two clients. A best-selling account of the expedition was given in Jon Krakauer's Into Thin Air, and the expedition has been dramatised in the 2015 film Everest. At the time of his death, Hall had just completed his fifth summit of Everest, more at that time than any other non-Sherpa mountaineer. Hall met his future wife, Jan Arnold, a New Zealand physician, during his Everest summit attempt in 1990. Hall and Arnold climbed Denali for their first date and later married. In 1993, Rob Hall summited Everest along with Arnold. In the catastrophic 1996 season, Arnold would have accompanied Hall on his Everest expedition, but she was pregnant. Two months after Hall died on the descent from Everest, she gave birth to their daughter Sarah Arnold-Hall. In 2002, Jan Arnold married German cabinet-maker Andreas Niemann, had another daughter with him, and currently resides in Nelson, New Zealand. Hall grew up in New Zealand where he had climbed extensively in the Southern Alps. In 1988, Rob Hall met Gary Ball, who would become his climbing partner and close friend. As with most other mountain climbers, Hall and Gary Ball sought corporate sponsorships to fund their expeditions. The partners decided to climb the Seven Summits, but upped the ante by summiting all seven in seven months. Starting with Everest in May, they climbed the last mountain, Antarctica's Vinson Massif, on 12 December 1990, hours before the deadline. After this success they realised that, to retain their sponsorships, each successive climb would have to be ever riskier and more spectacular, increasing the chances of an accident. Hall and Ball therefore decided to quit professional climbing and form a high-altitude guiding business. Their company, Adventure Consultants, was incorporated in 1992 and quickly became a premier expedition guiding company. That year they guided six clients to the top of Everest. In October 1993, Gary Ball died of pulmonary edema, leaving Hall to run Adventure Consultants on his own. 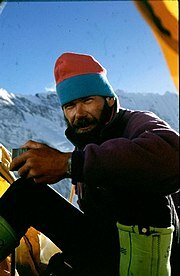 By 1996, Hall had guided thirty-nine climbers up to the top of Everest. Although the price of a guided summit attempt – US$65,000 – was considerably higher than that of other expeditions, Hall's reputation for reliability and safety attracted clients from all over the world. Rob Hall was well known in the mountaineering world as the "mountain goat" or the "show." The expeditions quickly encountered delays. Upon reaching the Hillary Step, the climbers discovered that no fixed line had been placed, and they were forced to wait for an hour while the guides installed the ropes (Rob nonetheless "fixed most of the mountain in 1996"). Because some 33 climbers were attempting the summit on the same day, and Hall and Fischer had asked their climbers to stay within 150 m of each other, there were bottlenecks at the single fixed line at the Hillary Step. Many of the climbers had not yet reached the summit by 2:00 pm, the last safe time to turn around to reach Camp IV before nightfall. Hall's Sardar, Ang Dorje Sherpa, and other climbing Sherpas waited at the summit for the clients. Near 3:00 pm, they began their descent. On the way down, Ang Dorje encountered client Doug Hansen above the Hillary Step, and ordered him to descend. Hansen refused. When Hall arrived at the scene, he sent the Sherpas down to assist the other clients, and stated that he would remain to help Hansen, who had run out of supplementary oxygen. At 5:00 pm, a blizzard struck the Southwest Face of Everest, diminishing visibility and obliterating the trail back to Camp IV. Shortly afterward, Hall radioed for help, saying that Hansen had fallen unconscious but was still alive. Adventure Consultants guide Andy Harris began climbing to the Hillary Step at 5:30 pm with water and supplementary oxygen. On 11 May, at 4:43 am, close to twelve hours after the blizzard had started, Hall radioed down and said that he was on the South Summit. He reported that Harris had reached the two men, but that Hansen had died sometime during the night and that Harris was missing as well. Hall was not breathing bottled oxygen, because his regulator was too choked with ice. By 9:00 am, Hall had fixed his oxygen mask, but indicated that his frostbitten hands and feet were making it difficult to traverse the fixed ropes. Later in the afternoon, he radioed to Base Camp, asking them to call his wife, Jan Arnold, on the satellite phone. During this last communication, he reassured her that he was reasonably comfortable and told her, "Sleep well my sweetheart. Please don't worry too much." Shortly thereafter, he died, and his body was found on 23 May by mountaineers from the IMAX expedition. His body still remains just below the South Summit. Jon Krakauer published an article in Outside and a book called Into Thin Air shortly after the disaster. In both, he speculated that the delays caused by the fixed ropes, as well as the guides' decision not to enforce the 2:00 pm turnaround time, were responsible for the deaths. Krakauer was criticised by Hall's widow for publishing their last conversation. Hall's radio transmission from the summit ridge was patched through and connected to his wife at home. The transcription of Hall's final conversation with his wife was reprinted in the book. Into Thin Air: Death on Everest, a TV movie on the 1996 Everest disaster, starred Nathaniel Parker as Rob Hall. The series Seconds From Disaster published an episode about the 1996 incident called "Into the death zone". Rob Hall's ordeal is heavily covered in the episode. The Neil Finn song "The Climber" was inspired by Rob Hall's death. Another documentary directed by David Breashears, who was on Everest in 1996, "Storm Over Everest" aired on PBS-Frontline in 2008. A feature film based on the events titled Everest (2015) was developed by Working Title Films and Universal Pictures, and directed by Baltasar Kormákur. Rob Hall is portrayed by Jason Clarke. Rob Hall is a character in the opera Everest (2015) by British composer Joby Talbot, which follows the major episodes of the 1996 Mount Everest disaster. ^ a b c Claudia Glenn Dowling (14 May 2001). "After Everest". Time Warner. Retrieved 21 May 2012. ^ "Meet our team, Dr Jan Arnold". INP Medical Clinic. Archived from the original on 8 February 2013. Retrieved 21 May 2012. ^ Gary Ball, climber, dies on mountain, Reuters, 11 October 1993, archived from the original on 11 September 2016 . ^ "Statistics of 7 summits climber Ball". www.7summits.com. Retrieved 12 August 2011. ^ "Fixed ropes – climbers guide to Everest". mounteverest.net. Retrieved 23 March 2015. ^ Hopewell, John (6 August 2013). "'2 Guns' Helmer Kormakur Set to Climb 'Everest'". variety.com. Retrieved 17 January 2014. ^ Dickinson, Matt (1999). The Other Side of Everest: Climbing the North Face through the Killer Storm. New York, NY: Three Rivers Press. ISBN 9780307558879. OCLC 857306645. Retrieved 3 October 2016 – via Google Books. First published as: Dickinson, Matt (1997). The Death Zone: Climbing Everest through the Killer Storm. London, UK: Hutchinson. ISBN 9780091802394. OCLC 59591265. ^ Leino, Eino; Gustafsson, Veikka (1995). Kohti huippua (in Finnish). Porvoo ; Helsinki ; Juva: WSOY. pp. 128–133. ISBN 9510205753. OCLC 58181970. ^ "Ascents - K2". Retrieved 31 May 2016.